So they rolled the stone aside [from Lazarus' tomb]. Then Jesus looked up to heaven and said, "Father, thank you for hearing me. You always hear me, but I said it out loud for the sake of all these people standing here, so that they will believe you sent me." While Jesus hasn't taught his disciples the key principle yet, he is proving it beforehand: The Father hears the Son. There can be no clearer example of this truth than his command in the next verse for Lazarus, who is clearly (four days) dead, to come out of his grave, and then it happens. This demonstration is for our benefit. When Jesus later promises that we will be able to pray through him and the Father will do what the Son asks, we know it is true! The Father has already demonstrated it in what would seem to be the most impossible of situations! So let's seek the Father's will and glory, asking Jesus for his power to be released through our prayers. 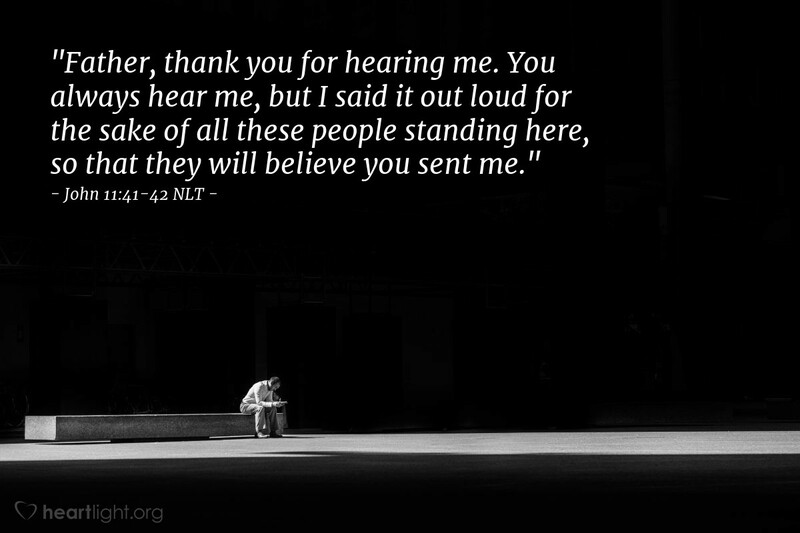 Father, thank you for the assurance that when I pray in Jesus' name, you hear me. Please give me wisdom and boldness as I pray in Jesus' name. Amen.